Are there grizzly bears in Washington state? Joel Connelly talks about the rate of recovery efforts for grizzly bears in the country, and specifically the North Cascades and Bitteroot Mountains of Washington, Idaho and Montana. Are there grizzly bears in Washington state?. By Joel Connelly. Seattle Post-Intelligencer. 11 Responses to Are there grizzly bears in Washington state? The North Cascades bear recovery zone is reported to have a handful of grizzly bears. In recent years they have been sighted with certainly. However, 5-6 bears are too few for recovery. A genetic bottleneck will soon develop. British Columbia could help on their side of the border. A few years back there was talk of reintroducing them to Manning Provincial Park and other areas of the B.C. North Cascades, but this plan seems to have disappeared. I asked the rangers at North Cascades this summer, and no one knew. Apparently there has not been a sighting for quite some time. If you ever get a chance to visit this area and the Pasayten, you are in for a treat. All native species are present I believe. It also boasts the highest concentration of lynx in the lower 48. Save bears, you are right, those were some ignorant comments. My comment was the one calling all those male commenters “pussies,” and then someone scolded me for being vulgar! Lol. I can’t believe how afraid people have become of animals in just a few generations. Presumably we made it this far despite many larger charismatic species…sabertooth cat anyone? 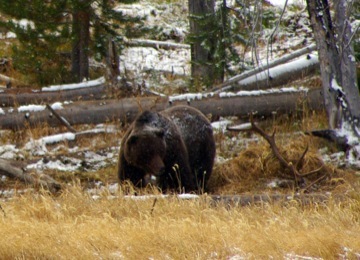 As a WA state backcountry hiker, the subject if Grizzlies in our midst is a common fireside topic. Most of us hope they are out there, but evidence is slim. However, there is alot of very remote country out there with many major wilderness river valley’s remaining trailess. Plenty of room to hide and plenty of country in which to thrive. Only if we would let them. Percy it is amazing people are so scared of carnivores. I agree with those above who read the comments to the original article. I thought, however, that the one by try2bobjective about it being mandatory to have a wildlife biologist sit in when these subjects are debated in political arenas was great. It would probably be great for ALL areas of discussion. I think the plan is still in place, just moves slow much like plan for Cascades on our side of border. A look at the website for the Government of BC, Ministry of the Environment reveals… “The Honourable Bill Barisoff, Minister of Water, Land and Air Protection has accepted the Recovery Plan for Grizzly Bears in the North Cascades of British Columbia. The Minister has instructed the Recovery Team not to translocate grizzly bears to the North Cascades until further direction is received”….direction being from the Liaison Committee that was put in place as part of the plan. If I were a betting man I would say based on the fact that there are a couple of hydro projects, significant stores of coal, and a great deal of timber interests here, that pursuing the plan with great zeal is not going to happen without public pressure and I don’t feel the pressure building anytime soon based on the sentiment from stakeholders received in public comment. Somebody help me out here…says “his provocative new book”…if I’m not mistaken this book was published in June of 2008. People in Washington State are avid outdoor people but there haven’t been any reasons for them to curtail activities in the woods or pick up their trash and be careful. Most of the people I meet outdoors are scared of bears, mountain lions and wolves and are happy to sit around the campfire and tell each other stories that make it worse. Education is not lacking, it is just wrong. They are never told the whole truth about animal behavior, only snippets of common advice like don’t run from a bear which goes in on ear and out the other. The black bears there have learned that if they are not seen by people they can live in close proximity and pick up leftovers without a fuss. Kids have been mislead by people they trust, like camp counselors, to think there is nothing in the Washington woods to harm them. Hence camping is a messy affair with garbage going in the fire, dishwater thrown in nearby bushes and candy in sleeping bags. They have been doing that way for years. They don’t want to change their habits so they argue that bears are killers. Nothing I could think of would be better for the people of Washington State than to have grizzly bears return there. The woods would be a much better place. Oregon has a excellent population of cougars. If there were none & someone proposed introducing cougars to Oregon I suspect that thousands of “concerned citizens” would be crying at the top of their lungs to “save the children” by stopping this insane act of introducing the cougar to Oregon. People are always looking at the wrong scapegoat!